Abstract: Ageing in the first world is not going to be what it was. For the first time in contemporary history, a massive wave of Baby Boomers is retiring. They are without a secured financial future and most new retirees will be obliged to age in place with very scarce assistance and resources. In parallel, longevity is increasing, offering elderly people a long new life as retirees. In this situation, social relationships are key for guaranteeing a more resilient community. Latest research shows that being social has a strong influence on people’s health, equivalent to giving up smoking, and nearly twice as beneficial as physical activity. Increased social interaction will promote mutual care and will support informal economies that will help retirees’ finances. Architecture, in this new social landscape, has an important responsibility. The suburban context that could respond to isolated-family-with-children way of living, is a hostile environment for an ageing couple or a single retiree. This paper explores the possibilities that architecture can find for retrofitting suburban fabrics in order to encourage social interaction. Traditional elements of suburban architecture, such as porches, yards and garages, could be transformed to aid the situation. The porch could adapt a more communal condition, through extensions and connections that can transform it into a casual clubhouse for a new community. The yard can be evolved as a commons for gathering or supporting suburban farming for subsistence or for the promotion of informal economies. The activity provoked by the communal gardens will provide physical and social benefits to the retirees. Lastly, the garage is a flexible piece that can be reinvented in retirees’ homes. The use of the car will be spaced out progressively and shared vehicles will start to be more usual with new retirees, which is also more economical. The garage would offer a place for gathering and for hosting common hobbies or for teaching retirees’ expertise to other people. These kind of activities would socially and financially aid elder people. This paper proposes these ‘third places’, with graphic examples where these new ideas have been applied to different suburban fabrics in the United States and also proposes how these could be adopted in the Australian suburban landscape. It is not new at all that in the history of American urbanism, a warning about the importance of community engagement related to the welfare of human beings, has been regularly dismissed. From Jane Jacobs (Jacobs 1961) to Colin Ellard (Ellard 2015), from journalistic to neuroscientific points of view, theoreticians have been insisting that space, and more specifically public space, is a key ingredient for wrapping the community life with a sense of belonging, that is, at the same time, welcoming and protective. Planning for public spaces in USA, with the main target of providing social welfare has been historically hitting an insurmountable wall made by bricks, so to speak, from very different origins—ranging from the independent idiosyncrasy of the settler mentality to the misunderstood identification between interventions for the sake of community welfare and those of a communist nature (Conn 2014). The stubbornness of constructing this wall is comparable with the persistence of trying to advocate for a more socially sensible planning of public space—from the Jane Adams Hull House’s studies in the beginning of the Twentieth Century to the hippy communes of the 1960s, and to the artificiality of the elitist communities proposed more recently by the proponents of ‘New Urbanism.’ Architecture, in this social landscape where aging is becoming an important factor with 79 million retired Americans by 2030 (Cohn and Taylor 2010), has an important responsibility, given the challenge any socially driven agenda has to face. The suburban context which responded to isolated-family-with-children way of living in the post-war era, has become a trap and is a hostile environment for an ageing couple or a single retiree. In such a scenario, this paper explores the possibilities that architecture can find for retrofitting suburban fabrics in order to encourage social interaction which benefit ageing and present results from an investigation that was done by design as a research method, taking three characteristic suburbs from the endless sprawl in the US. Upon an examination of the existing literature and looking at the history of planning, it is important to point here that strangely only a few of these American attempts for a caring and socially enabling community planning were truly connected to the city, which is the most historically tested and spontaneous formula of planning for community welfare. The same people that have worked hard against applying the city formula to the American context have cynically recognized the wonderfulness of life in the European cities. Density, informality, mixed-use, open boundaries, uncertainty, undefined spaces… are all concepts that have been mentioned tirelessly as part of this efficient formula by various sociologists and anthropologists, under various names such as Open City (Sennet 2013) or Third Spaces (Oldenburg 1989). All of them failed, most without even being tested, basically because, as Oldenburg pointed out prudently, the lack of city experience in collective psyche and the necessarily associated informality, makes the American citizenry “literally forget how to create one” (Oldenburg 1989:11). For the purpose of our research, we took the concept of Third Spaces and used as a design operational tool. So, it is important that we look at the definition of what a Third Place is? Ray Oldenburg referred to “third places” as the ones after home (first places), and workplaces (second ones), and he explained them as “great good places” for informal public gathering. He mentioned that the most important function of this spaces is “that of uniting the neighborhood”, referring also to their importance for creating a convivial atmosphere where people getting to know each other then take care for one another, fact that, he remarked, is extremely significant for the elderly people. Third places are also fun and serve significantly as political and intellectual fora (Oldenburg 1989: xvii-xxv). Someone would say that American way of living is different and that American society found other ways of feeling the community embrace, a basic human necessity, and they would be right, but we should mention some important counterparts to this assertion. One is that community gathering in America, based in places socially segregated and politically deactivated (such as the Church of the Mall), has nothing to do with a happening or buzz (Storper and Venables 2004) in the city, because the latter is always based on social mixture and intense negotiation, therefore always politically charged. Paraphrasing Oldenburg, we could say that the lack of quotidian political experience made Americans also forget about what real politics is, and the 2016 Presidential elections’ output was a very clear evidence of this dismissal. On the other hand, accepting the status of the American way of living is also an inconsiderate sacking of a public health problem denounced at least from the early 1980s (Wallis 1983), when it was noticed that “our mode of life… is emerging as today’s principal cause of illness”. In more pragmatic terms, as Oldenburg quoted, two-thirds of the $50 to $75 billion economic loss due to absenteeism (billions from 1989, which taking inflation into consideration is twice the amount today—as shown at Dollar Times Web page) are related to stress, something that is undeniably connected to a way of living (Oldenburg 1989:10). The balance—that Oldenburg required for a fulfilling daily life—between the domestic, the productive and the social (Oldenburg 1989:14), has been clearly denied in the American way of living. The domestic is based on a self-sufficiency where each room replicates the whole house (skipping most of the family interaction), the production aspect is placed in a way where each one needs to spend time and energy as forced commuters, and the social, as we explained, is framed in very specific places based on homogeneity where negotiation has been deactivated. The responsibility that architects have to all these facts, as the professional of the built environment, is undeniable and can no longer be ignored. A survey of the facts regarding aging and mental health reveals that although almost half of the American population suffer from some kind of mental instability in their lifetime (the U.S.A. is the country with the highest prevalence of reported mental health problems as showed report from Centers for Disease Control and Prevention—CDC 2011)—a fact that can no longer ignore the way people live. This paper is focused on a specific sector of the community that is going to be even more defenseless in the next coming years: the elderly people. One must keep in mind the growing dynamic of this population sector in the United States (it will increase at a rate of around 10,000 new retirees per day for the next 19 years), that will result in 79 million retired Americans by 2030 (Cohn and Taylor 2010). This social sector is retreating, for the first time in American history, with quite a long life expectancy (an average around 80 years old—Geoba.se 2017), and with shortages in social services and health care seriously threatening on the close horizon. The caring cost of this retirement rhythm is estimated at $3 trillion per year (Durett 2009), a cost which has to be in some way paid privately or publicly spent. Moreover, some of the retirement funds available for this purpose were drained by the 2008 crisis, and the baby-boomers are now facing their retreat immersed in an atmosphere of financial uncertainty for the first time in America contemporary history (Khanna 2016:111). In a very alarming way, more than half of the households where the head is over 55 has to rely almost entirely on Social Security income (Saad-Lessler et al. 2015), a program that is extraordinarily stressed in a nation with very urgent necessities, between them, 44 million people fed by public funds through the Supplemental Nutrition Assistance Program (USDA 2016). The situation looks like the clear announcement of a social collapse. Before asking about the way in which architects can contribute to relieving the situation we need to assume our responsibility given the facts portrayed above. We know that isolation is a fundamental base of the weakness suffered by a population in many senses (mental, social, economic, and political), and in this isolation urban planning has been the merciless executive hand. Many architects and urban planners have been underestimating the way in which their decisions would affect people’s lives, pushed by neoliberal economic forces or focused on their own disciplinary experimentation. This can’t be go any longer—an ethical imperative must become the norm. We need to use our imagination, reinventing architectural fabrics in a way that is able to reshape social relationships, aiming for a more resilient community to front this unclear future. As American activist and Director of the National Domestic Workers Alliance, Ai-Jen Poo pointed, the situation is such that it will require the reinvention of an infrastructural solution, similarly to the interstate highway system of the 60s or the transcontinental railroad (Poo 2015). The resiliency that would result from the fortification of the social bonding provoked by a reshaped fabric will be reflected in a community that will be politically stronger, economically more independent, and physically healthier. A united community would be able to better fight for their rights, and it would develop alternatives to the capitalist economy for relieving their finances more readily. We also know nowadays that people with strong social relationships increase their survival odds by 50 percent (benefit equivalent to giving up smoking and nearly twice as beneficial as physical activity—Harmon 2010). We have been traditionally focusing on retirement as something associated with medical assistance and we only recently realized that it is much more a social issue. If all the mentioned benefits are important at any age, then they are critical for elderly communities as a way to build self-defense mechanisms for advancing when society will no longer be able to take care of them. For knowing how to act as architects, we need to start defining the architectural framework where these communities are aging. In a different way than it was at other times--when retirement was associated with a family move to a more relaxed place--nowadays 85 percent of the elderly community will be forced by their situations to age in place (D’Vera and Taylor 2010). Natural Occurring Retirement Communities (or NORCs) are happening spontaneously all over America, and these places are not prepared for a necessary new way of living and the desired increase in social activity. We need to add to this that, although official government data is very vague in the quantification of how suburban America really is, 53 percent of American citizens described their life routine as suburban and 21 percent as rural (Kolko 2015). As a result of both of these facts, much more than two-thirds of Americans will be condemned in the actual situation of ageing in an isolated way. We will use the research-by-design method as a way to explore what are the alternatives that architect can offer to this situation. This methodology is very specific of the discipline of Architecture for achieving cognition through ideas that are materialized with form and includes space (Hauberg 2011), with an output able to easily provide social feedback. With an architectural design as the response to a specific problem, we investigated typological solutions that are able to engage the imagination and concerns of the people and hence can be used as base for a public discussion and evaluation. The research-by-design exploration was elaborated to maximize the space of possibility (Delanda 2011) and research different alternatives for being comparatively analyzed by the different agents involved in the problem. With this methodology, we aimed to find out how the architecture of the fabric should be reacting to the local differences due to social, economic or environmental issues. A point that needs to be made here is the research process needs to be cognizant of the valuable input from various stakeholders–the owners, developers, construction companies, and public institutions, could be involved in different ways into this specific problem depending on their precise situation—from the owners economic possibilities to the different administrative levels or social policies that would be needed to enforce the change. We researched here how to adapt three traditional elements of American suburban typologies (yards, porches and garages) for creating architectural fabrics that able to help to elderly communities. The typologies are set in three different American urban contexts that represents different socio-economic conditions. The first selected site is Levittown’s suburbs in New York, a response that, as we shall explain below, investigated architectural interventions based on a spontaneous and modest private investment related to self-construction processes. The second site aimed for the upper classes living in gated communities in Miami sprawl, where the new necessities could promote neighborhood agreements for making possible the necessary restructuring of public and public spaces. The last selected context was Detroit, a context immersed in a climate of public and private investment for reclaiming the city’s economic health, where the investigation led with the notion that architectural reformulations could result from private investors attending this new demand (houses for aging) and taking advantage of public initiatives and commodities. The most basic architectural adaptations that was necessary to be thought of was due to the problem of mobility associated with age. However, the most challenging architectural task was to think how to reactivate third places for provoking social interaction. The investigation of the three contexts of the suburban typology resulted in finding some common spaces (such as yards, porches, and garages) with flexible characters that was extrapolated in the design exercise to have the potential for transformation into third places. These spaces already offer us a kind of third-space condition in the sense that they are neither fully part of domestic intimacy nor properly public. Our initial context analysis showed great potential for easily adapting these spaces as community sharing and gathering spaces. Yards, porches, and garages contain opportunities for being redefined as part of an architectural strategy for triggering a new life routine associated with retirement. Yards became the necessary contact with the outside (in a new retiree’s life where there is time to spend just outside), offering the perfect frame for gardening as one of the most relaxing and popular retirees’ activities. Porches, especially in good weather condition, emerge as an outdoor living where the new retirees would stay long journeys, providing the idyllic space for social gathering. Garages, the last component, would be able to provide a space that it can be reconfigured in a new retiree life more independent from the car, for instance, as a workspace—able to render extra income—, or as a hobby room for spending time in an active way. In all cases, the design research guideline stipulated that the transformations must simultaneously bring changes in the family domestic life and provide provocation for community interaction. Keeping this in mind is a key factor for converting these single components of an architectural typology to a network of elements acting more as a communal infrastructure. In a sense, the design is an attempt to convert trees into rhizomes. The premise can be constructed thus–if one share their garden as a community one, they benefit from other neighbors sharing theirs as a gardening school or an improvised farmer market. Opening their porches for a party or a political discussion would mean the imminence of another porch gathering happening in the following days. A garage could be someone else’s appliance repair shop, and someone else’s garage could be converted into your yoga classroom’. The possibilities are endless and the ways of living that they draw are exciting. The sequence of all this social exchange would almost immediately produce economic alternatives based on the exchange of goods and services. This would encourage a passive member of the community towards integration and it would result in stability and resiliency for the whole community. As a result, each member will keep active as part of a social whole, with the undeniable psychological benefit of feeling their importance for the community with immediate repercussions in their physical health. Even when the mentioned transformation is based more on programmatic changes than material ones, it is obvious that some architectural changes would be necessary and they will require some funding. We also acknowledged that despite of the socio-economic homogeneity that characterized suburban America, the economic stress could be happening in a specific community in different degrees, so we needed to think in diverse funding sources. Some communities will become NORCs progressively, that means the impossibility of a coordinated effort for getting funding for the desired architectural transformations. In these cases the modifications would be based on very small economic efforts, privately based, made as a kind of business investment for farming your yard, renting your swimming pool or selling home-made cakes in your garage. Other communities will become NORCs more abruptly, so they will be able to coordinate in the community the required reforms for adapting the architectural framework to their new lives styles. In this last case, they could be able to arrange loans with the community endorsement or to manage the possibility of getting official support or donors for making their intentions became real. In some other cases, we could also imagine developers investing in these architectural transformations for getting back rent from the households, or even for taking advantage of some of the extra land in some of the houses for building services for the whole neighborhood as a business model. It is important to point here that whatever way the project is to be managed, it would have an important relational role with the architectural solution, and this solution in turn would strongly affect the project management. The project of architecture becomes blurry and uncertain when it includes deep social implications, claiming with it a new definition for the architecture (far away from unpolluted modernist formalist paradigm), and a new role for the architect (who would act more as a community agent). This is the first mass-produced suburb in the United States. Originally made with similar houses, the fabric has been customized by their inhabitants to the point that nowadays looks very diverse. With population from different generations, Levittown is already happening as a progressive NORC, hence we envision its transformation by casual aggregation in an informal and unpredictable way. The first household intervention would encourage others in a kind of chain effect. The drawn proposal has been done with mass-produced elements from a Home-Depot catalog as the cheapest and fastest way to accomplish the desired modifications. With respect to private property, each household would just release the necessary space at their back for opening a common alley as access to the different facilities that the owners would casually build in their backyards. Swimming pools, spaces for art, orchards, sports playgrounds, etc., all these are infrastructures provided by the different households as community contributions and potential value for being exchange by other goods or services. The new communal infrastructure also includes solar panels and domestic wind-power generators as a way to alleviate household future energy expenses. Some of the Miami suburban agglomerations originally developed in the late 1940s and 1950s (as Bay Harbour area or Lauderdale-By-The-Sea), have been hosting newer developments done with more generous standards and oriented to the medium-high socio-economic class. Some of these communities were conceived as gated communities and are common to find a cul de sac urban structure where a few houses are totally segregated of the public roads. Mostly occupied by Baby-boomers with a comfortable financial situation most of them are obliged nowadays to age in place because, even selling their houses, they will not be able to find someplace to live with similar standards in the Miami metropolitan area. These neighborhoods, extraordinarily homogeneous, are becoming NORCs suddenly and their inhabitants have financial capacity for supporting the necessary architectural transformations. Organized as a community, they would fund the adaptations for their new life as retirees. 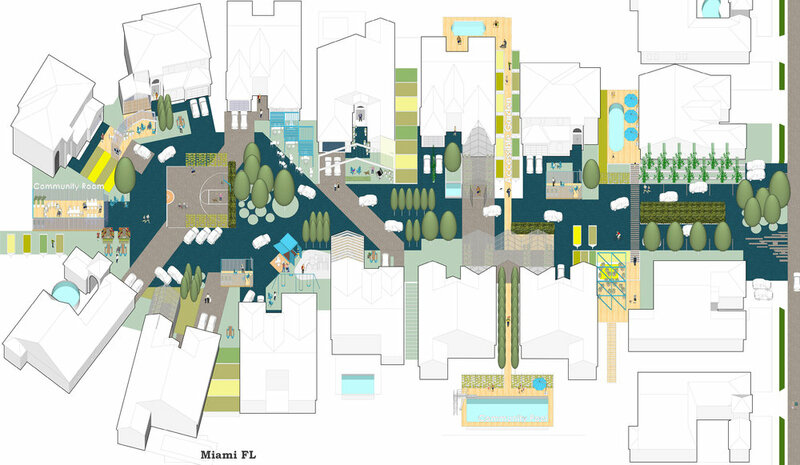 The main reform is based on the idea of converting the cul de sac road in a new communal third-space, taking advantage of the expected decrease in the car use. Outside gardens and greenhouses, gathering places, sports playgrounds, walking paths, communal infrastructures (as small swimming pools and cafes), are some of the spaces built taking advantage of the road space that it will turn into a more pedestrian-oriented place. It is well known the problem of Detroit City, affecting downtown and the closest suburbs to the city center. The White Flight phenomenon starting in the1950s progressively emptied the city in favor of an intense suburban growth. The most historic suburbs in areas as Midtown and New Center, built with fantastic Victorian homes from the beginning of the Twentieth Century, were gradually abandoned. The situation nowadays is that this extraordinary architecture must be demolished and the character of these places is disappearing. Local administration is making a huge effort trying to revitalize parts of the city. The necessity of fabrics with very specific demands (as the ones that we would be needing for aging socially) is a perfect excuse for the city’s revitalization. In order to be able to bring as much life as possible with the smallest intervention in the street character, our proposal tries to incorporate a public building as a complementary infrastructure built on the internal alley road, encouraging mixed uses. Hosting the garages underneath this new building would be able to incorporate restaurants, coffee shops, co-working spaces and other facilities for the community. In this way, the new building becomes an activity seed encouraging the investment in its proximity. The covered alley road becomes also a pergola for social gathering and outdoor activities. Some of the existing vacant plots could be used as park gates for accessing the plot’s social spine. The operation could be financially supported by a developer whose could own the houses, probably bought very inexpensively, as part of a business model. The development could be specifically oriented to elderly people and so too the services provided by the new building (it could host day care centers, medical offices, and social clubs). The local administration would be very supportive of this idea as a way to help them to bring people back to Detroit city. The first conclusion of this paper is the claim that a research-by-design methodology is self-evidently important for architecture and specifically for explorations related with social concerns such as this one. The resulting design is accessible by peers and other and it enables the collection of feedback from public discussion much easier, all the while stimulating one much more than policy documents and research reports. It is our responsibility as architects to produce images that are able to capture people’s imagination offering solutions for fronting an existing challenge. Only through the design can we evaluate the possibilities that architecture has for involving all the agents and overcoming all the difficulties. The second conclusion is related to the possibilities that some elements of the current American typologies have for being a seed of the necessary transformation that is able to build a more resilient elder communities in an uncertain future. Yards, porches, and garages have some of the social qualities that define third spaces and could be transformed in key components in this new social fabrics, as we can see in the developed examples. The third conclusion is about the importance of contextual conditions for a research like this. The generic problem of ageing would always be embedded in socio-economic and spatial particulars and hence the end result would be substantially different depending on the socio-economic context and the specificity of the urban fabrics to work with. The application of this research to three different urban context is a way to make this explicit. The last, but not the least, is the conclusion that as architects, we have the obligation, and the means to intervene in the social challenges that we need to overcome for a just, sustainable and equitable future. It is our specific agency by doing this in a proactive manner, which entails using our design capacities to explore spaces of possibility. By projecting imaginative design scenarios, while maintaining the rigor of research, we can offer what is most required by people facing an uncertain future–hope. The images illustrating this paper have been developed by the author as part of the University of Arkansas Community Design Center’s team (UACDC), as Associate Professor of Architecture and Landscape Architecture, and Project Architect. These drawings were part of an exploration of this issue done in the Spring 2016 Semester with the Fay Jones School of Architecture + Design’s students. The exploration done in the UACDC has been the base for the present paper, and it has been recently published as UACDC (2017) Houses for Aging Socially: Developing Third Place Ecologies, ORO Editions, San Francisco. Centers for Disease Control and Prevention (CDC), Public Health Surveillance Program Office, Office of Surveillance, Epidemiology, and Laboratory Services (2011) Mental Illness Surveillance among U.S. Adults. Conn, S. (2014) Americans against the City. Anti-Urbanism in the Twentieth Century, Oxford University Press, New York. De Landa, M. (2011) Philosophy and Simulation: The Emergence of Synthetic Reason, Continuum International Publishing Group, New York. Durett, C. (2009) Musings: Establishing a Healthy, Sustainable Lifestyle for an Aging Generation", The Cohousing Association of the United States, 5 August 2009. Available from: <http://www.cohousing.org/node/1708> (accessed 28 October 2017). D’Vera, C. and Taylor, P. (2010) Baby Boomers Approach 65-Glumly, Pew Research Center, 20 December 2010. Available from: <http:/ /www.pewsocialtrends.org/2010 / 12/20 /baby-boomers-approach-65-glumly /> (accessed 28 October 2017). Ellard, C. (2015) Places of the Heart: The Psychogeography of Everyday Life, Bellevue Literary Press, New York. Available from: <http://www.geoba.se/population.php?pc=world&type=15>, (accessed 28 October 2017). Harmon K. (2010) Social Ties Boost Survival by 50 Percent, Scientific American, 28 July 2010. Available from: <http:/ /www.scientificamerican.com/article/relationships-boost-survival/> (accessed 28 October 2017). Khanna, P. (2016) Connectography. Mapping the future of Global Civilization, Random House, New York 2016. Kolko, J. (2015) How Suburban Are Big American Cities?, FiveThirtyEight, May 21, 2015. Available from: <https://fivethirtyeight.com/features/how-suburban-are-big-american-cities/> (accessed 28 October 2017). Oldenburg, R. (1989) The Great Good Place, Da Capo Press, Cambridge. Poo, A. (2015) The Age of Dignity: Preparing for the Elder Boom in a Changing America, The New Press, New York. Saad-Lessler, J., Ghilarducci, T., and Bahn, K. (2015) Are U.S. Workers Ready for Retirement? Schwartz Center for Economic Policy Analysis at the The New School, March 2015. Sennet, R. (2013) The Open City, Available from: <https://www.richardsennett.com/site/senn/UploadedResources/The%20Open%20City.pdf> (accessed 28 October 2017). Wallis, C., (1983) Stress: Can We Cope, Time Magazine, 6 June 1983, 48-54.